Life on the boat has a different feel and its dynamic is unique. Fishermen are a team, they work articulately and each one has a role. Of course I probably lost the real dynamics for two reasons: first, because I spent half the time asleep as a result of motion sickness pills (and the other half throwing up), and second, because being a woman and research biologist onboard, men presented themselves as courteous and polite as they could, not jesting and even watching their vocabulary. They were extremely kind to us and I remember them with great appreciation. The Captain even gave us his cabin (which is the best of them all) to sleep. The views from the boat were beautiful and sometimes a group of dolphins would accompany us in the journey. Other companions were birds, gulls, pelicans and frigate birds that roosted or flew over the boat all the time. Our clothes were completely filled with bird droppings. A hat was a truly important accessory. 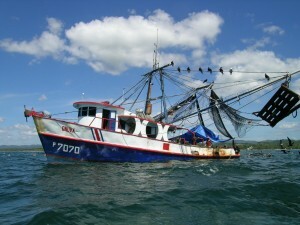 Then there was the purpose of the trip: shrimp fishing. The boat was placed in position and the “winch” started downloading the trawl, this operation takes for as long it needs to reach the desired depth, in our case, up to 400 m.
Then there is the time of dragging, then the nets are uploaded the catch is unloaded on the deck, revealing the capture. There is a lot of wildlife there, some of it apt for commerce, some of it not. 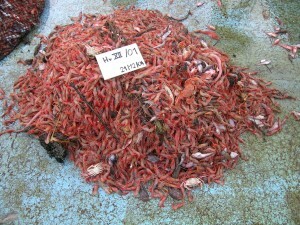 Occasionally the target species reached 50-60% of the catch, but many times it was around 20-30% of it. The rest were animals that died needlessly. It’s called accompanying fauna or “by-catch”. They were just in the same place as the target species. 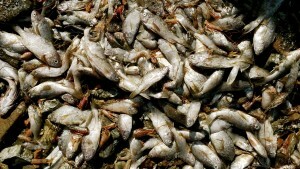 Due to the pressure change, many creatures suffer internal damage so it is not possible to return them to the sea. They were thrown back yes, but as waste. I always wondered if anyone would allow an activity like this in a terrestrial habitat. If anyone would consider it ethical and legal to conduct a hunt for “x” species, knowing that it can miss 70% of the shots, killing all kinds of other animals. The oceans are huge and incredibly rich, but even the largest ecosystem has a load capacity. A limit at which the imbalance exceeds the capacity of recovery. Sometimes the discussion about closing trawling revolves around the need of maintaining the activity for work creation, but what work can there be for fishermen in an ocean where resources have been exhausted? Personally, traveling onboard the boat was a bittersweet experience because I learned the value of those who work there and at the same time, I noticed the little value given to life under the sea. For me there is no such thing as a sustainable trawling. Discussions and pressure (political, legal or market-wise) for innovation in techniques and more selective fishing gear should continue.